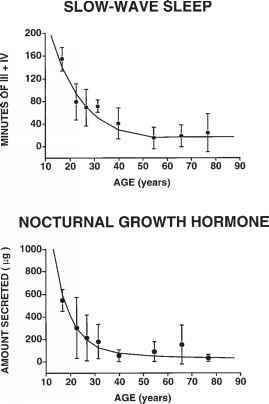 Aging is associated with dramatic decreases in GH and insulin-like growth factor (IGF)-1 secretions and with pronounced alterations of sleep quality (13,45,46,70-72). When similar bedtime schedules are enforced in young and old men, the sleep onset time and the total sleep period are not significantly modified by age but sleep stage distribution is markedly altered, with more frequent and prolonged awakenings, a pronounced reduction in the duration of SW stages, a decrease in the total amount of REM stages, and an earlier timing of the appearance of REM stages. In healthy elderly men over the age of 65, the total amount of GH secreted over the 24-h span is generally less than one third of the daily output of men under 30 yr (13,46,73-76). 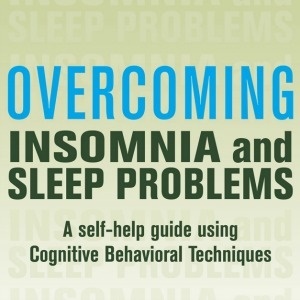 Similarly, the amount of SW sleep in older adults is reduced in the same proportion (46). This decline in overall GH secretion appears to be achieved primarily by a decrease in amplitude, rather than frequency, of GH pulses. In a retrospective analysis involving nearly 100 simultaneous recordings of sleep and 24-h GH secretion in adult men ages 18-82 yr, we have recently shown that these dramatic effects of aging on SWS and GH secretion occur early in adulthood in an exponential fashion and are essentially complete by the beginning of the fifth decade (77) (Fig. 6). Similar observations in a smaller subject population studied overnight have been recently reported, although the non-linear decrease in the amount of SW sleep failed to be detected (78). 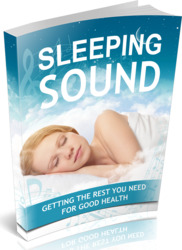 Although early studies had generally concluded that sleep-related GH pulses were absent in the elderly, the findings of more recent studies are concordant in showing persistent, but reduced, GH secretion during sleep (13,46,74,76). In our retrospective analysis, it was apparent that the proportion of daily GH output that occurs during the first few hours of sleep, does not decrease with age, but remains stable or even slightly increases. A significant correlation between levels of IGF-1 and delta power has been reported in older adults (79). The parallelism between decreased amount and quality of deep sleep and diminished somatotropic activity raises the interesting possibility that some of the peripheral effects of the hyposomato-tropism of the elderly, such as the reduction in lean body mass, may partially reflect a central alteration in sleep control. Fig. 6. Chronology of aging of SW sleep (scored visually) and nocturnal GH secretion (mean ± SEM for each age bracket). The subjects were 102 healthy non-obese men, ages 18-83 yr, who were grouped according to age bracket. Unpublished data.